Last year, the U.S. Department of Agriculture (USDA) and the Animal and Plant Health Inspection Service (APHIS) agencies investigated the appearance of what appeared to be GE wheat on an Oregon farm, and concluded that it was an isolated incident. The investigation was closed after ‘exhausting all leads,’ but new GMO wheat has been detected at the Montana State University’s Southern Agricultural Research Center (SARC) in Huntley, Montana, where Monsanto and researchers grew GE wheat as part of field trials from 2000 to 2003. The Oregon wheat was later suspected by environmentalists to be a development by Monsanto, meant to withstand the spraying of RoundUp. The APHIS found no evidence at that time that the GE wheat had been released into the market. Just this week, the agency is releasing its full findings on their investigation with personal information and confidential business information redacted. This time; however, a new investigation will be opened to investigate regulatory compliance issues with the GE wheat found growing at the research facility in Montana. While this site was previously authorized for Monsanto to conduct field trials, the company is not supposed to be growing GM wheat or any other GM crop there now. Furthermore, the GM wheat found growing there now has been genetically tested and is significantly different from the GE wheat found growing in Oregon last year. Since the original field trials granted to Monsanto, the APHIS has not deregulated any GE wheat varieties. They are not to be for sale or in commercial production in the U.S.
During the Oregon farm GE wheat investigation, conducted over a period of ten months, 291 interviews were held with wheat growers, grain elevator operators, crop consultants, and wheat researchers. Thousands of pages of evidence were collected and carefully reviewed. Also, 100 samples were collected from businesses that purchased and sold ‘certified’ seeds from the farm in Oregon, as well as harvested grain that was gathered from the grower. It was after researching this incident exhaustively that the APHIS concluded that the incident was a one-off. No one was sure how the GM wheat was found to be growing at the Oregon farm. A copy of the 12,842 pages that comprise the complete report of investigation and evidence file is available on the APHIS website. Though Monsanto’s initial GM wheat field tests were conducted under APHIS’ regulatory approval, they have no business growing GM wheat now. This is a serious breech of compliance, and as many have suspected, Monsanto has little regard for regulatory approval for their GM crop experiments, though they often receive it through political maneuvering and illegal campaign contributions nonetheless. 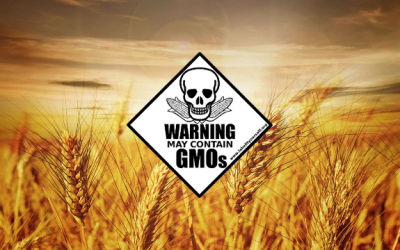 The field trials were supposed to be a part of research conducted on the safety of GM crops, not a free pass to develop new wheat strains to sell to the unwitting public. The APHIS claims that it is taking steps to make sure that other strains of GM wheat do not show up elsewhere in the U.S., and that they will inspect field trials planted in 2014. Additionally, they will remove plants that appear ‘as volunteer plants,’ meaning that they appeared later after an initial harvest, as plants sometimes do. It is clear with this new Montana GM scandal that cross-breeding, the scarce but resilient GM plant that lasts after a crop has been cleared, as well as the insidious business habits of Monsanto are still threatening organic farmers’ fields and the right of the U.S. public to have GMO-free food. Isn’t it a concern that it is appearing in places where it shouldn’t be? Why are you scaring people. None of this experimental wheat was ever close to commercial stores. If anything, the evidence shows that the controls in place for testing new potentially beneficial seeds and crops are working. STOP SCARING PEOPLE!!!!! You have no understanding of nature. Just growing this crap releases the pollen and perverted DNA into the wild and contaminates other plants. Deer eat this crap and it contaminates the DNA of the meat and you are clearly an uneducated mouth. How long have you been reading and researching this stuff? I highly doubt you have been studying this stuff for very long. Get educated before you start talking. Why do you think many of these foreign countries like France and China will not accept shipments of these perverted foods into their country anymore?!! Like Forest’s mom said, “Stupid is as stupid does”. And sometimes you have to shake people to wake them up. You sound like that McDonald’s commercial “You deserve a break today” yet you did not do anything to deserve the break!! The Creator is the Architect and Designer of this world and made things to work by design and these evolution-believing idiots think they can make His designs “better” when in reality THEY are corrupting nature. People NEED to be scared before they will react, else they just do what you are wanting to do, bury your head in the sand and think everything is OK. Ignorance NEVER solved anything and when you chose to not do anything, you still have made a choice and only contribute to the problem. Kind of like people and their ignorant idealism that they are somehow entitled to their “opinion” when opinions NEVER lead you to the truth, they only misdirect you because if their idea was correct, it wouldn’t be an opinion, it would be FACT!! This is what building your house on the rock is about, all other ground is sinking sand, opinions are sandy ground and only good for burying your head in it!! GET SCARED PEOPLE AND WAKE UP!! These corporate thugs only care about money, not YOU!!! You had me until you espoused creationism, which is a belief, over evolution, which is scientific fact, thereby invalidating your entire argument and how dare you even mention science after that? However, delanobob is a either a Monsanto shill or a dumbass.